Definition at line 30 of file CLRenderInformationBase.h. Definition at line 27 of file CLRenderInformationBase.cpp. Definition at line 38 of file CLRenderInformationBase.cpp. Definition at line 54 of file CLRenderInformationBase.cpp. References CCopasiVector< T >::add(), mListOfColorDefinitions, mListOfGradientDefinitions, and mListOfLineEndings. Definition at line 124 of file CLRenderInformationBase.cpp. Adds a copy of the given color definition to the end of the list of color definitions. Definition at line 212 of file CLRenderInformationBase.cpp. References CCopasiVector< T >::add(), and mListOfColorDefinitions. Referenced by CLRenderFlattener::flatten(), and CCopasiXMLParser::ColorDefinitionElement::start(). Adds a copy of the given gradient definition to the end of the list of gradient definitions. Definition at line 294 of file CLRenderInformationBase.cpp. References CCopasiVector< T >::add(), and mListOfGradientDefinitions. Referenced by CCopasiXMLParser::LinearGradientElement::end(), CCopasiXMLParser::RadialGradientElement::end(), and CLRenderFlattener::flatten(). Adds a copy of the given line ending to the end of the list of line endings. Definition at line 373 of file CLRenderInformationBase.cpp. References CCopasiVector< T >::add(), and mListOfLineEndings. Referenced by CLRenderFlattener::flatten(), and CCopasiXMLParser::LineEndingElement::start(). Definition at line 400 of file CLRenderInformationBase.cpp. References getBackgroundColor(), getColorDefinition(), getGradientDefinition(), getKey(), getLineEnding(), getReferenceRenderInformationKey(), mListOfColorDefinitions, mListOfGradientDefinitions, mListOfLineEndings, mName, CCopasiVector< T >::size(), CLLineEnding::toSBML(), and CLColorDefinition::toSBML(). Referenced by CLLocalRenderInformation::toSBML(), and CLGlobalRenderInformation::toSBML(). Creates a new color definition. Definition at line 190 of file CLRenderInformationBase.cpp. Referenced by test000097::addGlobalRenderInformation(), and test000097::addLocalRenderInformation(). Creates a new linear gradient definition. Definition at line 272 of file CLRenderInformationBase.cpp. Creates a new line ending. Definition at line 351 of file CLRenderInformationBase.cpp. Creates a new radial gradient definition. Definition at line 262 of file CLRenderInformationBase.cpp. Returns the background color which is either the id of a color in the list of color definitions, or a color value. Definition at line 378 of file CLRenderInformationBase.cpp. Referenced by addSBMLAttributes(), CQLayoutScene::fillFromLayout(), CCopasiXML::saveRenderInformationAttributes(), and CLRenderResolver::setBackgroundColor(). Returns a pointer to the color definition with the given index, or NULL if the index is invalid. Definition at line 173 of file CLRenderInformationBase.cpp. References mListOfColorDefinitions, and CCopasiVector< T >::size(). Referenced by addSBMLAttributes(), CLRenderResolver::fill_base_maps(), and CCopasiXML::saveRenderInformationDefinitionElements(). Returns a const pointer to the color definition with the given index, or NULL if the index is invalid. Definition at line 182 of file CLRenderInformationBase.cpp. Returns a pointer to the gradient definition with the given index, or NULL if the index is invalid. Definition at line 245 of file CLRenderInformationBase.cpp. References mListOfGradientDefinitions, and CCopasiVector< T >::size(). Returns a const pointer to the gradient definition with the given index, or NULL if the index is invalid. Definition at line 254 of file CLRenderInformationBase.cpp. Definition at line 391 of file CLRenderInformationBase.cpp. Referenced by CQNewMainWindow::addDefaultRenderInfoItemsToList(), CQNewMainWindow::addGlobalRenderInfoItemsToList(), addSBMLAttributes(), SBMLDocumentLoader::createLayout(), SBMLDocumentLoader::readListOfLayouts(), CCopasiXML::saveRenderInformationAttributes(), CQLayoutView::slotLayoutChanged(), updateRenderInformationList(), and CQNewMainWindow::updateRenderInformationList(). Returns a pointer to the line ending with the given index, or NULL if the index is invalid. Definition at line 334 of file CLRenderInformationBase.cpp. References mListOfLineEndings, and CCopasiVector< T >::size(). Referenced by addSBMLAttributes(), CLRenderResolver::fill_base_maps(), CCopasiXML::saveRenderInformationDefinitionElements(), and CCopasiXMLParser::LineEndingElement::start(). Returns a const pointer to the line ending with the given index, or NULL if the index is invalid. Definition at line 343 of file CLRenderInformationBase.cpp. Returns a pointer to the list of color definitions. Definition at line 156 of file CLRenderInformationBase.cpp. Returns a const pointer to the list of color definitions. Definition at line 164 of file CLRenderInformationBase.cpp. Returns a pointer to the list of gradient definitions. Definition at line 228 of file CLRenderInformationBase.cpp. Returns a const pointer to the list of gradient definitions. Definition at line 236 of file CLRenderInformationBase.cpp. Returns a pointer to the list of line endings. Definition at line 317 of file CLRenderInformationBase.cpp. Returns a const pointer to the list of line endings. Definition at line 325 of file CLRenderInformationBase.cpp. Definition at line 479 of file CLRenderInformationBase.cpp. Referenced by CQNewMainWindow::addDefaultRenderInfoItemsToList(), CQNewMainWindow::addGlobalRenderInfoItemsToList(), CCopasiXML::saveRenderInformationAttributes(), CQLayoutView::slotLayoutChanged(), updateRenderInformationList(), and CQNewMainWindow::updateRenderInformationList(). Returns the number of color definitions. Definition at line 148 of file CLRenderInformationBase.cpp. Referenced by CLRenderResolver::fill_base_maps(), and CCopasiXML::saveRenderInformationDefinitionElements(). Returns the number of gradient definitions. Definition at line 220 of file CLRenderInformationBase.cpp. Returns the number of line endings. Definition at line 309 of file CLRenderInformationBase.cpp. Referenced by CLRenderResolver::fill_base_maps(), CCopasiXML::saveRenderInformationDefinitionElements(), and CCopasiXMLParser::LineEndingElement::start(). Returns the key of the referenced render information object..
Returns the id of the referenced render information object.. Definition at line 132 of file CLRenderInformationBase.cpp. Referenced by addSBMLAttributes(), CLRenderFlattener::flatten(), and CCopasiXML::saveRenderInformationAttributes(). Removes the color definition with the given index. Definition at line 200 of file CLRenderInformationBase.cpp. References mListOfColorDefinitions, CCopasiVector< T >::remove(), and CCopasiVector< T >::size(). Removes the gradient definition with the given index. Definition at line 282 of file CLRenderInformationBase.cpp. References mListOfGradientDefinitions, CCopasiVector< T >::remove(), and CCopasiVector< T >::size(). Removes the line ending with the given index. Definition at line 361 of file CLRenderInformationBase.cpp. References mListOfLineEndings, CCopasiVector< T >::remove(), and CCopasiVector< T >::size(). Sets the background color to either the id of a color in the list of color definitions, or a color value. Definition at line 383 of file CLRenderInformationBase.cpp. 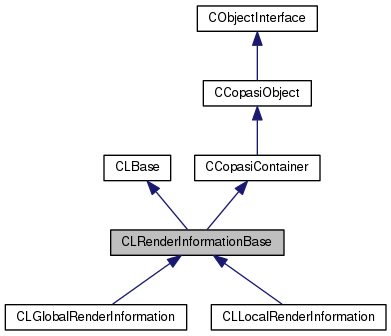 Referenced by CLRenderFlattener::flatten(), CCopasiXMLParser::LocalRenderInformationElement::start(), and CCopasiXMLParser::GlobalRenderInformationElement::start(). Sets the name of the object. Definition at line 471 of file CLRenderInformationBase.cpp. Sets the key of the referenced render information object. Sets the id of the referenced render information object. Definition at line 140 of file CLRenderInformationBase.cpp. Definition at line 39 of file CLRenderInformationBase.h. Referenced by getBackgroundColor(), and setBackgroundColor(). key string for the render information. Definition at line 47 of file CLRenderInformationBase.h. Referenced by CLGlobalRenderInformation::CLGlobalRenderInformation(), CLLocalRenderInformation::CLLocalRenderInformation(), getKey(), and ~CLRenderInformationBase(). Definition at line 40 of file CLRenderInformationBase.h. Referenced by addColorDefinition(), addSBMLAttributes(), CLRenderInformationBase(), createColorDefinition(), getColorDefinition(), getListOfColorDefinitions(), getNumColorDefinitions(), and removeColorDefinition(). Definition at line 41 of file CLRenderInformationBase.h. Referenced by addGradientDefinition(), addSBMLAttributes(), CLRenderInformationBase(), createLinearGradientDefinition(), createRadialGradientDefinition(), getGradientDefinition(), getListOfGradientDefinitions(), getNumGradientDefinitions(), and removeGradientDefinition(). Definition at line 42 of file CLRenderInformationBase.h. Referenced by addLineEnding(), addSBMLAttributes(), CLRenderInformationBase(), createLineEnding(), getLineEnding(), getListOfLineEndings(), getNumLineEndings(), and removeLineEnding(). The name of the render information, which is more informative than the key. Definition at line 53 of file CLRenderInformationBase.h. Referenced by addSBMLAttributes(), getName(), and setName(). Definition at line 38 of file CLRenderInformationBase.h. Referenced by getReferenceRenderInformationKey(), and setReferenceRenderInformationKey().